I was lucky enough to have spent my fall semester drinking Guinness, dancing to folk music, and enjoying the craic* with some amazing lads and lassies in Galway, Ireland. I can wholeheartedly say that I left a piece of myself behind in that amazing little city. Galway was truly a second home, and I owe every laugh and smile to the amazing people I met in that incredible city. When people talk about their abroad experiences, they typically go on and on about the beautiful scenery, the excellent cutlery, and “that time we shared a bottle of rosé at the top of the Eiffel tower”. This is pretty much to be expected. Once we’re home we love to talk about the incredible things we experienced, typically leaving out any hardships we endured in our semesters abroad. What a lot of people don’t like to talk about is the hardships they endured while they were in a foreign, strange country. For me, that was my homesickness. Throughout my semester (especially the first and last two weeks) I became a little flustered whenever I saw a text or an Instagram post of my families and friends. How could life at home possibly go on… without me?! Absolutely impossible! I’ll admit it – I felt a little pain in my heart when I saw a video of my nephew take his first crawl across the kitchen floor. I found myself sitting in my kitchen, viscously refreshing the Head of the Charles website, eagerly waiting to see how my teammates raced and wishing I was on the side-lines cheering them down the river. I had to wipe a couple of tears from my eyes when I FaceTimed my entire family sitting at the Thanksgiving dinner table with a big dish of my dad’s homemade stuffing just starring at me. When I wasn’t busy exploring the emerald isle, I was quietly longing for movie nights with the girls, cookouts at the beach, my fluffy golden retriever Cooper, and of course, my mom’s hugs. I think that it’s healthy to recognize the good and bad in every situation. 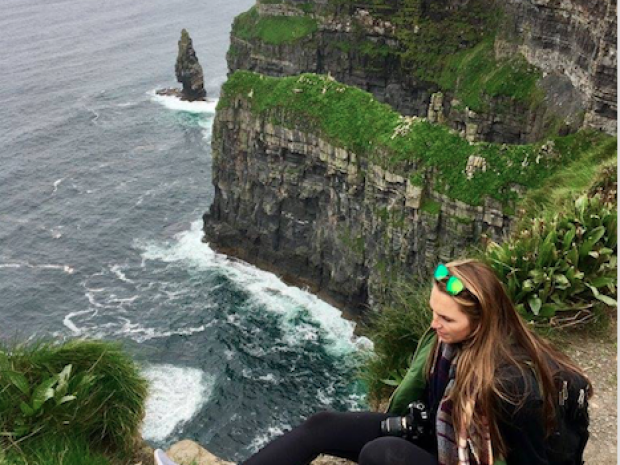 Spending a semester in Ireland was an incredible experience because it not only showed me that the world is a lot bigger and more beautiful than I could ever imagine, but also that I had taken for granted how precious my life at home really is. Though homesickness can hurt really bad sometimes, it is truly amazing having such special people to miss so much. Above all, my greatest takeaway from spending a semester abroad was reminding myself how blessed I to have such wonderful friends and family, both at home and in the Trinity Community.